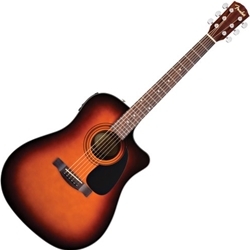 The redesigned Fender CD-140SCE dreadnought guitar brings you the warm, balanced tone of a rosewood body combined with premium features not always found on instruments of its class: a solid spruce top, rolled fingerboard edges, and a new easy-to-play neck shape. The upgraded Fishman Presys preamp has volume control, a built-in tuner, a 3-band EQ, and a polarity inversion control (phase button). With its single cutaway, rosewood fingerboard and headcap, and Graph Tech nut and bridge saddle, the CD-140SCE is both a capable instrument and a great value. The bright, responsive tone of a solid spruce top makes the Fender CD-140SCE project really well. It's also ready for any playing style â€” aggressive strumming, flatpicking, or fingerpicking â€” thanks to its Easy-to-play neck and the rolled edges of its rosewood fingerboard.